Chairman Mendelson, members of the committee, thank you for allowing me to speak with you today. My name is David Cooper. I am the Senior Economic Analyst at the Economic Policy Institute (EPI). EPI is a nonpartisan, nonprofit research organization in Washington, D.C., whose mission is to analyze the economy through the lens of the typical U.S. working family. EPI researches, develops, and advocates for public policies that help ensure that the economy provides opportunity and fair rewards for all U.S. workers, with a focus on policies to support low- and middle-income households. I am testifying today in opposition to the repeal of Initiative 77, the voter-approved measure that gradually raises the District’s tipped minimum wage over eight years, at which point the same minimum wage would apply to all District workers, regardless of whether they receive tips. Such “one-fair-wage” systems are already in place in eight states. Last week, EPI published a report, which I authored, that analyzes the tipped workforce in D.C. and compares tipped workers in D.C. with tipped workers in San Francisco and Seattle—two cities that have one-fair-wage policies. The report notes the problems created by having a separate lower tipped minimum wage, the bad incentives and enforcement challenges it creates, and most importantly, goes into detail on the harm that it causes tipped workers. I have included the report (Cooper 2018) with this testimony. Today, I want to highlight a few key research findings from the report and from other research that speak to some of the arguments that have been put forward against Initiative 77. First, one of the primary arguments made against raising base wages for tipped workers is that it will severely damage city businesses—particularly the restaurant industry—leading to closures and layoffs. This argument is essentially the same one that is made every time a minimum wage increase of any kind is proposed anywhere. These claims have been researched exhaustively, with the overwhelming conclusion of the academic literature being that moderate increases in minimum wages largely have their intended effect: raising wages for low-wage workers with little to no impact on employment levels or overall business trends (see Cooper, Mishel, and Zipperer 2018; Schmitt 2013; and Luca and Luca 2018). In the one study that has looked at changes in the tipped minimum wage, Allegretto and Nadler (2015) analyzed the impacts of higher tipped minimum wages on workers in the restaurant industry over 20 years of data and arrived at the same conclusion: higher tipped minimum wages were associated with higher restaurant industry wages, and little, if any, change in employment levels. Indeed, as the new report (Cooper 2018) shows, in cities that have adopted one-fair-wage policies, tipped employment and industries that employ tipped workers continue to grow. As shown in Table 1, over the last four years, full-service restaurant employment in D.C. has grown by an average of 4.0 percent per year. In San Francisco, a one-fair-wage city with a $15 minimum wage for all workers, full-service restaurant employment grew by an average of 3.2 percent per year over the same period. In the Seattle MSA, full-service restaurant employment grew by 3.5 percent per year. So while D.C.’s restaurant boom has outpaced these cities in recent years, it hasn’t been by that much. Note: Wages include base wages and tips. Second, there have been claims that D.C. is different from these other cities because it has a large share of small, independently owned businesses. I can’t speak to the ownership of D.C. restaurants, but we do know empirically that D.C. does not have an unusually large share of “small business” restaurants. As shown in Figure A, County Business Patterns data from the Bureau of Labor Statistics (BLS) indicate that D.C. actually has a smaller share of “small business” restaurants than either San Francisco or Seattle1 (Cooper 2018). That holds true whether “small business” restaurants are defined as those with fewer than 20 employees, or those with fewer than 50 employees. Though not shown in the figure, County Business Patterns data also reveal that the District also has a smaller share of small business restaurants than Boston, New York City, or the U.S. average as a whole. Restaurants in D.C. tend to be larger establishments than in most of the rest of the country. Note: Values for Seattle reflect all of King County, Washington. Third, pay for tipped workers is higher in both San Francisco and Seattle than it is in D.C. As shown in Figure B, among servers and bartenders, the median hourly wage in San Francisco (including both base wages and tips) is 21 percent higher than the median wage for those workers in D.C. In King County, Washington, it’s 7 percent higher. These findings from my research (Cooper 2018) are consistent with existing research on wages for tipped workers in one-fair-wage states compared with states with lower tipped minimum wages (Allegretto and Cooper 2014). The findings are also consistent with Bureau of Labor Statistics Occupational Employment Statistics data on wages of waiters and waitresses. Notes: Wages include both base wages and tips. Values for Seattle reflect all of King County, Washington. Finally, as you hear from tipped workers on this issue, be aware that the experience of tipped work is not the same for all tipped workers and there are significant disparities in pay within the D.C. tipped workforce. 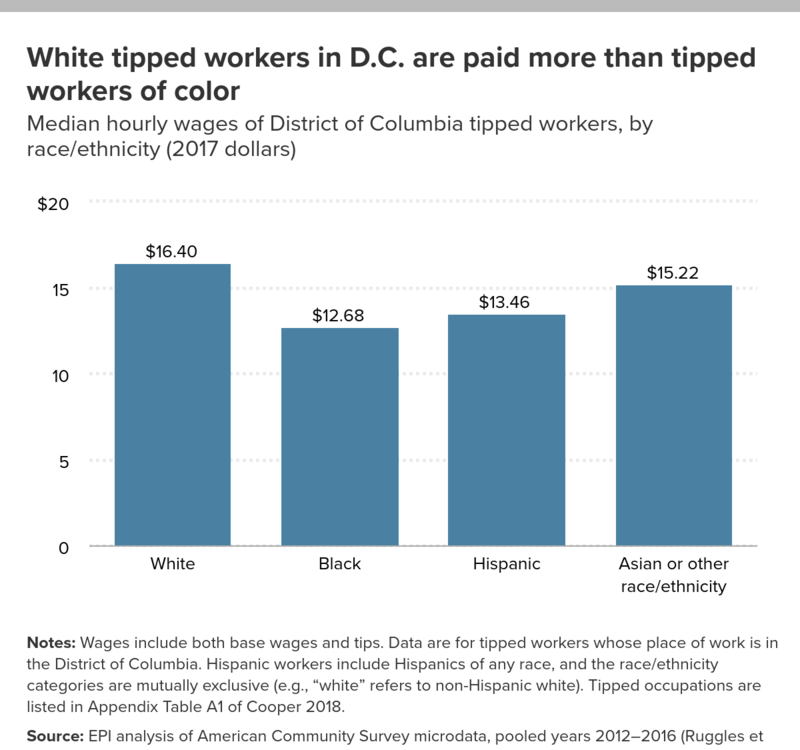 As shown in Figure C, my analysis finds that the typical black tipped worker in D.C. receives 23 percent less per hour than the typical white tipped worker; Hispanic tipped workers receive 18 percent less per hour. Figure D shows that women tipped workers in D.C. earn 8 percent less per hour and 20 percent less per year than men tipped workers because they tend to work fewer hours per week. We can surmise that at least some of this disparity in hours is involuntary. Again, these median hourly and annual wage figures include base wages and tips. The upshot of all of this is simple: Tipped workers are better off in places where they get the regular minimum wage regardless of tips, and in those places, the industries that employ tipped workers have adapted, and continue to operate successfully. There is no empirical basis for repealing Initiative 77. Notes: Wages include both base wages and tips. Data are for tipped workers whose place of work is in the District of Columbia. Hispanic workers include Hispanics of any race, and the race/ethnicity categories are mutually exclusive (e.g., “white” refers to non-Hispanic white). Tipped occupations are listed in Appendix Table A1 of Cooper 2018. 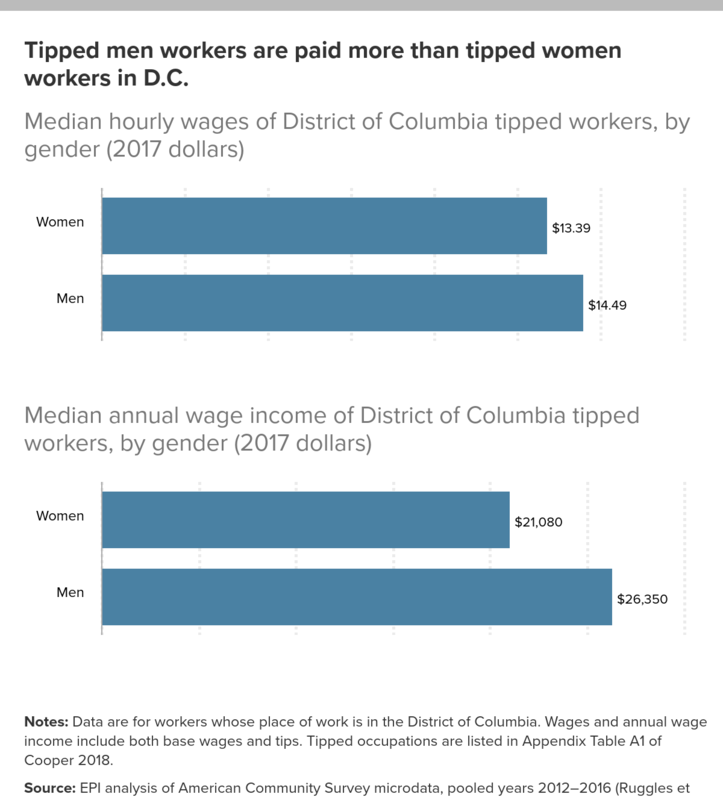 Tipped men workers are paid more than tipped women workers in D.C.
Notes: Data are for workers whose place of work is in the District of Columbia. Wages and annual wage income include both base wages and tips. Tipped occupations are listed in Appendix Table A1 of Cooper 2018. 1. Data for Seattle reflect all of King County, Washington. Allegretto, Sylvia, and Carl Nadler. 2015. “Tipped Wage Effects on Earnings and Employment in Full-Service Restaurants.” Industrial Relations 54, no. 4: 622–647. Allegretto, Sylvia, and David Cooper. 2014. Twenty-Three Years and Still Waiting for Change: Why It’s Time to Give Tipped Workers the Regular Minimum Wage. Economic Policy Institute Briefing Paper no. 379, July 2014. Bureau of Labor Statistics Quarterly Census of Employment and Wages (BLS-QCEW). Various years. Public data series accessed through the QCEW are available through the QCEW Databases and through series reports. Cooper, David. 2018. Why D.C. Should Implement Initiative 77: Tipped Workers Do Better in ‘One-Fair-Wage’ Cities; Restaurants Continue to Thrive, Economic Policy Institute, September 2018.
Cooper, David, Lawrence Mishel, and Ben Zipperer. 2018. Bold Increases in the Minimum Wage Should Be Evaluated for the Benefits of Raising Low-Wage Workers’ Total Earnings. Economic Policy Institute, April 2018. Luca, Dara Lee, and Michael Luca. 2018 Survival of the Fittest: The Impact of the Minimum Wage on Firm Exit. Harvard Business School NOM Unit Working Paper No. 17-088, August 2018. Ruggles, Steven, Sarah Flood, Ronald Goeken, Josiah Grover, Erin Meyer, Jose Pacas, and Matthew Sobek. 2018. Integrated Public Use Microdata Series USA: Version 8.0 [data set]. Minneapolis: University of Minnesota. https://doi.org/10.18128/D010.V8.0. Schmitt, John. 2013. Why Does the Minimum Wage Have No Discernible Effect on Employment? Center for Economic and Policy Research, February 2013. U.S. Census Bureau, County Business Patterns (CBP). Various years. Public data series accessed through the CBP Databases. Accessed August 2018.